Carmela’s parents founded the Castellano Family Foundation (CFF) in 2001, after her father, Alcario Castellano, won the state’s largest lottery jackpot at the time. Carmela’s parents operated the Foundation for the first decade of its existence and it is guided by the core principles of community, family, social change, empathy, and integrity. In 2012, Carmela’s lifelong commitment to equity and justice for the Latino community assumed new dimensions when she joined the Board of CFF. In 2015, she took on an even bigger role, becoming the President of the CFF Board. 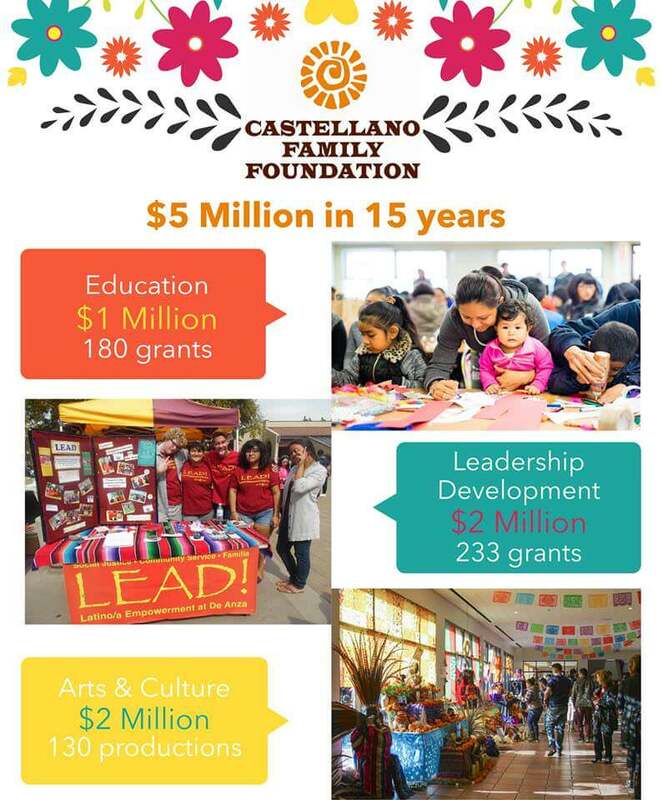 In the last 15 years, CFF has awarded $5 million in grants to nonprofit organizations investing in Latino arts and culture, education, leadership development and diversity in Santa Clara County. Carrying on the legacy started by her parents in forming the Foundation, Carmela is focused on promoting diversity within philanthropy overall – both in C-suite roles and overall staffing, and in giving back to the Latino community. As the spokesperson for CFF, Carmela has brought these issues to the national stage through her participation in events such as the National Summit on Family Philanthropy, Hispanics in Philanthropy Conference, and the National Council of La Raza Town Hall 2017. In addition to the topics noted above, Carmela has used these forums as opportunities to speak on the importance of grant making to small organizations, community-based grant making and the sustainability of family philanthropies. CFF was founded with a mission to uplift the Latino community in four main areas: education, arts and culture, leadership, and diversity. Over the years, CFF has supported the work of organizations that advance the Latino community. “Our grantees are the reason why we continue to do what we do. We are thrilled with their incredible work and the important contributions they are making to Santa Clara County,” continued Carmela. Enabling Latino youth and youth of color to achieve their education goals. Investing in the leadership of Latinos and nonprofit partners. Carmela has been involved in the National Center for Family Philanthropy (NCFP) since 2015, when she joined NCFP’s Advisory Group on Trends in Family Philanthropy. The Advisory Committee is tasked with guiding this national research initiative to identify emerging issues, changes in funding priorities, innovative approaches to giving and decision-making, and anticipated giving patterns among philanthropic families nationally. In 2017, Carmela accepted an appointment to the NCFP Board of Directors. In this role, she works to further the mission of the organization and its important initiatives for giving families. NCFP has been inspiring generations of giving for more than 20 years. The organization was is currently led by, Virginia Esposito who has worked for decades to advance private philanthropy through research. Almost 15 years ago, Carmela and her husband Angel Garcia invested in Del Paso Boulevard by purchasing space and opening a small business in the heart of the Westlake community. 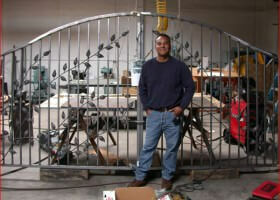 They opened Iron Angel, a small business specializing in the design, fabrication and installation of custom wrought iron gates and ornamental art. In doing so, they became committed to the revitalization and beautification of the area which had become economically depressed over the years. During California’s recession, many of the small businesses located there closed or moved out of the area, turning the once vibrant hub into an arid region of the city. Together, they worked to revamp their own space and partnered to open an art gallery next door to Iron Angel. Initially, the gallery served as an event space for local fundraisers and festivals and displayed work from various local Latino artists. The pair also collaborated with Gallery 2110 to bring fine art to Del Paso Boulevard. Over the years the gallery space has featured working artists of many styles and genres, but now primarily serves as an events venue bringing live music and entertainment to the area. In 2014, Carmela and Angel were instrumental in bringing Son of a Bean Coffee and Art to the area. Managed by longtime friend Michael Chaves, Son of a Bean and Art is family owned and operated. In addition to offering locally roasted coffee, it is also a place for local artists to hang out and display their work. Since its opening, Son of a Bean and Art has become a backbone of the community and a local watering hole for the neighborhood. In 2015, Son of a Bean was named the Best Accidental Art Gallery by the Sacramento News and Review and the venue continues to promote and celebrate local artists. The venue recently started Jazz on the Boulevard, featuring local jazz musicians on Friday nights. Considering Del Paso Boulevard a second home, Carmela and Angel have dedicated their time and energy to working with the city on the revitalization of this important region. As part of their ongoing commitment to this goal, Carmela and Angel continue to host important events aimed at bringing art and culture to the boulevard. Most recently, Carmela’s brother Armando and his group Trio SF A’dam preformed at an event. Additionally, Iron Angel hosted a special screening of Boulevard Nights for the community, which featured the actors Richard Yniguez and Danny De La Paz in person to sign autographs and meet fans. Carmela has always had a love of the performing arts. She spent much of her youth dancing folklorico, Mexico’s modern folk dance tradition, which is a blending of elements from its Indigenous, African and European heritages. She continued dancing into her high school years, performing professionally with Los Lupeños de San José, promoting her heritage and culture through the art of dance. 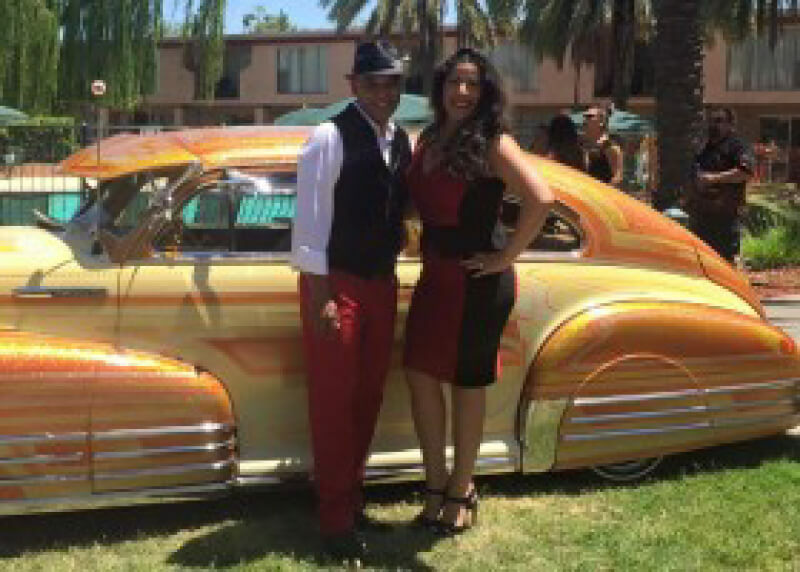 Continuing in that tradition, Carmela now sings in a band with her husband, celebrating their Chicano roots through their shared love of music. Carmela is dedicated to developing and promoting Latino artists in both her professional and personal life. In addition their role in bringing Iron Angel and Son of a Bean Coffee and Art to Del Paso Boulevard, she and Angel are also members of the band Q-VO. Angel formed the band in 2010 and Carmela joined him at his encouragement later that year. She is currently one of the band’s female vocalists singing alongside her husband, who is Q-Vo’s lead vocalist. 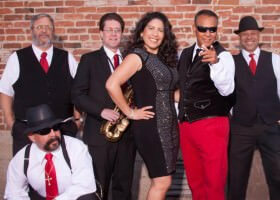 Q-Vo specializes in R&B, Chicano Soul, Funk, Oldies and Latin Classics and plays at celebrations, festivals, and fundraisers throughout Sacramento and the Bay Area. Founding the band was the fulfillment of a lifelong dream for Angel, and becoming a member has offered Carmela an outlet for her endless energy. They both enjoy being part of this musical family and giving back to the community through this artistic expression. Being a part of Q-VO offers them a work-life balance we all strive for. The band plays numerous events each year to a variety of audiences, from small festivals to the State Fair. The group has opened for Los Lobos, Malo, and Brenton Wood. Q-VO is a Chicano slang term that translates to “what’s up?” or “how’s it going?” This name was chosen to articulate the band’s casual, unique, and positive vibe. Q-VO also embodies the couple’s Latino heritage, promotes their ethnic background, and keeps them close to their roots through the music they play. As part of CFF’s 15th Anniversary celebration in June 2017, Carmela’s father’s documentary “Memories of Cinco de Mayo and 16th of September Celebrations in San Jose 1986-1997” premiered. The film highlights the phenomenal Cinco de Mayo celebrations that occurred in San Jose as sponsored by the San Jose GI Forum during the 80s and 90s. All the footage and photographs in the documentary were captured by Carmela’s father and this video represents the only comprehensive record of these historic events. Not only did Carmela help produce the film, she also had the privilege of conducting the foundational interview with her father, Alcario, which ultimately served as the documentary narration. Through this documentary Carmela hopes people will come to recognize that his commitment to the community – to arts and culture, education and leadership – the mission of the Foundation – is something he has lived for decades.